What to say? 45 km is a long day, but most on the beach which goes fast and I hitched the last 5 (it was just a road walk and I have seen roads before). The first stretch was interesting and not easy. Colec Beach is made of small pea gravel–soft and moves under foot–so it makes a difficult surface to walk. Then there was a lot of cliff up and down with a fair share of gorse. Stopped at Riverton for second breakfast, thinking perhaps of calling it a day, splitting up the penultimate stretch, but there was not much attraction there so I pressed on. One issue was a stream crossing that the guidebooks said not to attempt at high tide. As luck would have it, I was hitting that point at precisely high tide, so I had to improvise by catching some private farm roads up and around the stream head. It was a nice reprise of my many pasture walks, and included one stretch where hundreds of sheep were packed into a holding pen I needed to cross. There were a number of dairy cattle and of course your standard pasture full of steers. They are the most troubling as the steers always look at you expectantly, as if you are bringing them something, and they follow along as you pass, looking plaintive. And of course their destiny is hamburger. 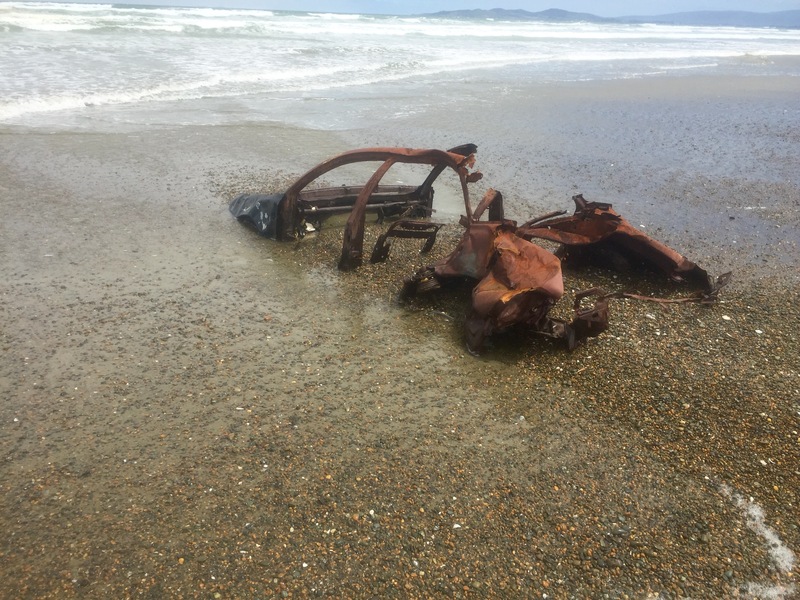 After clearing the main stream I still had to ford a waist deep flow, leading out onto the Invercargill beach made famous by Anthony Hopkins’s motorcycle run in “The World’s Fastest Indian.” Made good time on a firm flat surface, then walked the road a bit when a kiwi named John picked me up. He was only going a short distance, but in typical kiwi fashion he kindly took me all the way into Invercargill. I have felt a twinge of guilt when taking a hitch at the end of a long day, but inevitably I meet someone well worth meeting and realize that’s what the trip is all about. To try to “white blaze” the TA is to miss out on some of the more interesting people NZ has to offer. Got a room at the Tuatara Backpackers and had a glass or two at the Zookeepers Cafe, the only place that serves Invercargill Brewery beer on tap–good! Every thing I did today was with a sense of an ending. I knew Martin would be the last hut I stayed in on this trek, as was the descent off the mountain through the forest. The first kilometer was just like yesterday’s, really rough with a lot of downed trees, but after the shift to the Ports water race, it got interesting (at least for a while). This area was a big 19th century gold mining region, and the water race is a 20+ km path beside a ditch for sluicing gold. 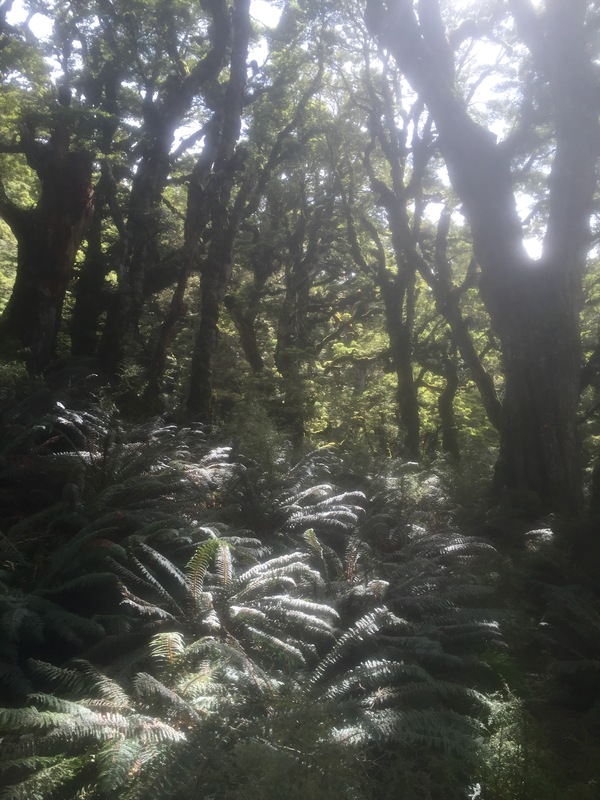 What stood out were the trees– Rimu and Totaru growing in profusion. There were massive trees, long since fallen, slowly rotting away but straddled by new trees growing up out of the rot. The riot of growth was breathtaking. Parts of the trail passed derelict machinery, old mine shafts, and the remnants of timber-framed aqueducts that carried the sluices over stream ditches. Then it wound down to the bay which marks the end of land. I made my way to Colec Bay campground, did laundry, had good meal in tavern (actually two, remain completely ravenous), trying to decide how far to trek tomorrow. One of the first very hot days but also incredibly windy, particularly up on the balds. Good solid day of walking once again on difficult surface. In the hut book, one of the thru hikers (Keith who has been one week ahead this whole trip) compared today’s surface to the Raetea swamp, which I thought was the worst trail I’d ever hiked. Parts of today were a close second. Guess they don’t want us to finish with ease. 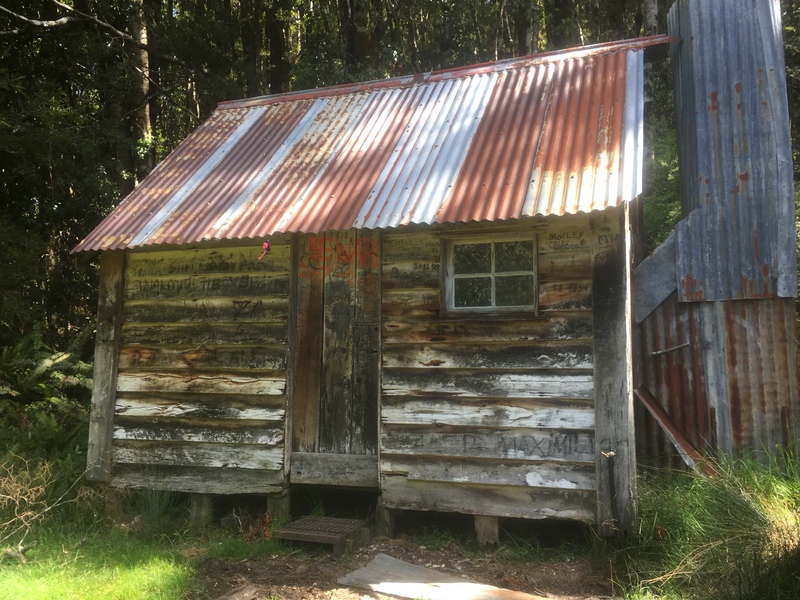 The Martin Hut is best described as rustic (again, going out with a bang). The water was clogged, and when I opened the barrel, I decided to scout out some water from a nearby stream instead. It’s hard to be sentimental about difficult tasks, but that will be the last water scouting expedition on this trail as I hike down off the ridge tomorrow, and the rest is hiking on the beach from town to town. When you get to Maine while hiking the AT, everyone starts looking for Katadhin–a massive singular mountain rising up in the middle of the state. I think Bennett and I were in the Bigelows on the first clear day where we saw it– the destination. Bluff isn’t imposing in the same way, but it is the bottom of the country, next stop Antarctica. Today up on the ridge I could see the sweep of the bay bending to Invercargil and the hills that make up Bluff and adjacent territory. The view really was of the end of the world. 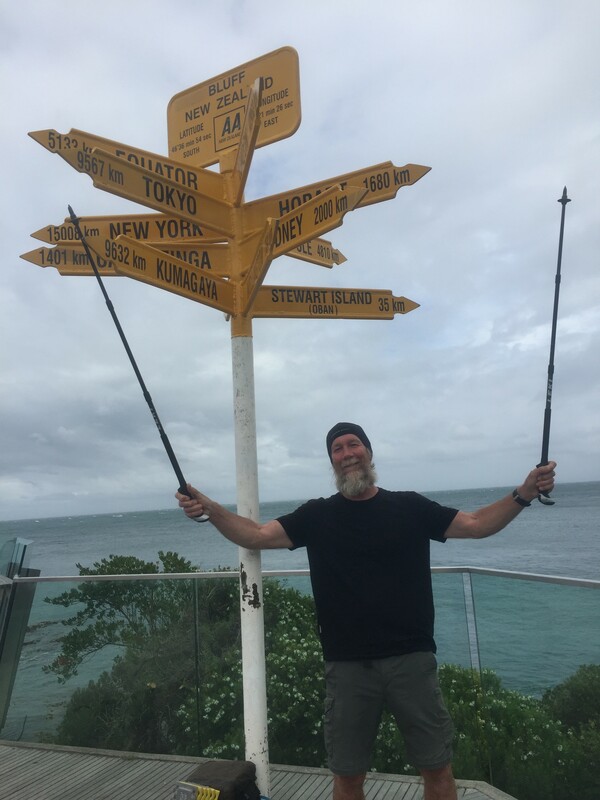 After a forest/road walk I hitched into Otautau for just enough supplies to get over the next stretch but mainly to rest up a bit and eat a big meal or two. Caught a ride with a character driving a Land Rover Defender hauling a load of railroad ties. He moved here from the north island three years ago and bought a building with two storefronts, one will soon be a cafe. He gave me coffee and showed me around town. Unfortunately it was Sunday and the place was very much a ghost town. No place open for late breakfast so I hung out at the Otautau Hotel drinking coffee, waiting until I could get a room and a short nap followed by dinner and sleep. I’m afraid sleep has become an obsession at this point in the long walk. I’m going to have to report that Otautau is not on my list of towns to visit again. The forest this morning reminded me so much of the north island. 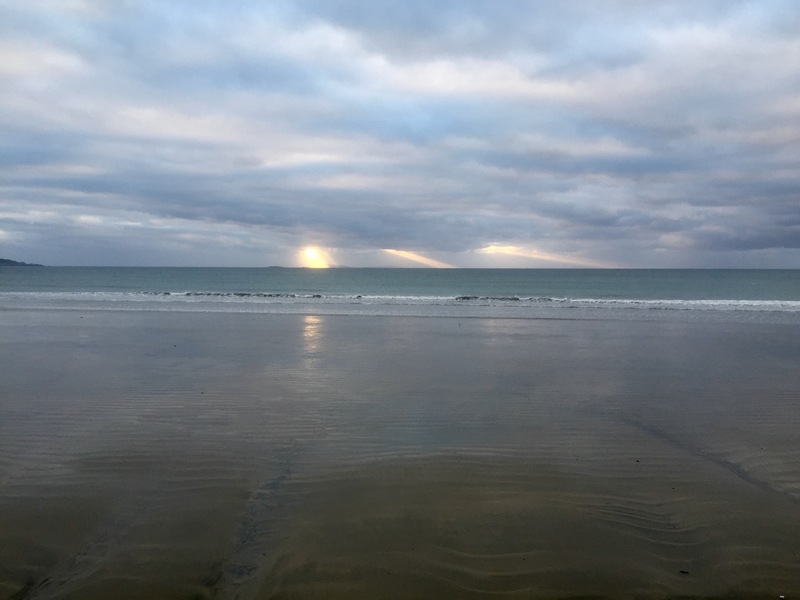 There is a symmetry in that the very beginning and the very end of the TA are beach hikes and the parts connected are dense forest hikes. Very mossy, muddy, rooty, with little trail to follow, just the orange triangles. Got a late start just because I had to get some sleep after yesterday’s marathon. The forest led up to a peak which then became an open rocky ridge line. At first is was completely fogged in so I had trouble finding the trail marker poles, but then it lifted and the valley opened up, it had an edge of the end of the world feel to it. 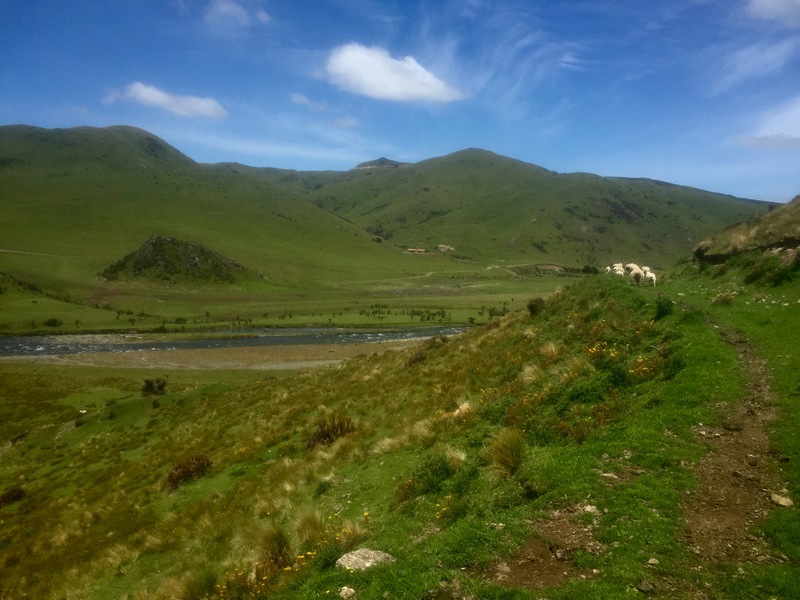 After a steep climb down I followed a farm road out to a bridge and gravel road, or, as the kiwis call it, a metal road. Long afternoon’s tramp brought me to the road and the intersection of several large farms, and no place to camp. One thing about the TA, there is often no place to camp at the end (or beginning) of a main section. As I stood there once again very tired and puzzling what to do, a hunter on his way up to look for wild boar offered to take me up the trail to the point where it enters native bush where it is ok to camp. I had little choice as I needed a place to stay and it will make tomorrow an easier day, something my weary bones welcome. Talking with him on the ride up was interesting. His family runs one of the big farms in the area, and he used to play polo in Europe before returning to work the sheep and cattle. He is hoping to put up a hut somewhere near where I was stuck to make available to TA trampers. Interesting guy to say the least (and he had beer). Got settled in the woods, made dinner, and welcomed going to sleep early. Tomorrow I’ll probably head to Otautau to resupply and a big meal. Although I was refreshed by big meals in Te Anau, I was not prepared for the sheer physical effort today required. As I look at my daily hiking numbers– time and kilometers, I’m struck by how they do not reflect effort. 40 km on a gravel road is a stroll compared to 10 km in the woods and marshlands I walked through today. 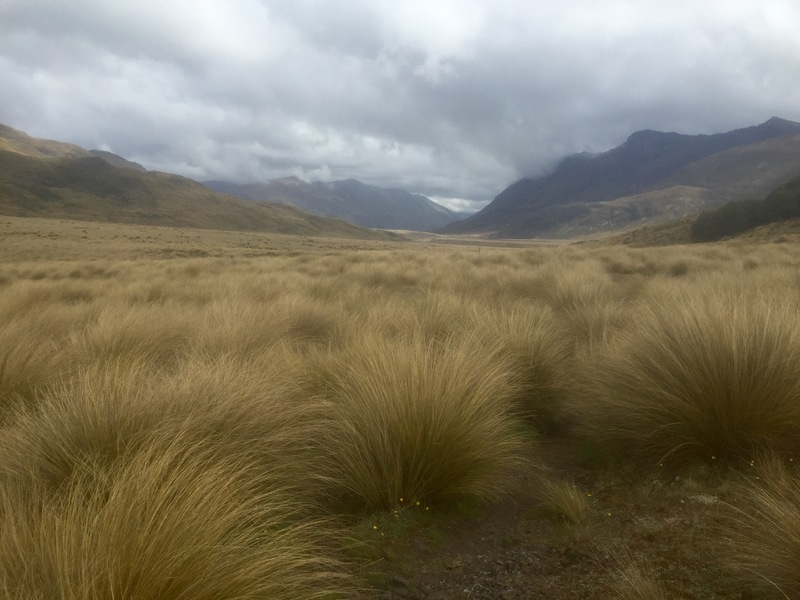 Forests without trails (only blazes), open fields of tussock grass so high you could barely make out the trail marker poles, full of meandering streams you could not see because of the grass. Stepped into a few water holes and fell. I did bump into my friend Mike who I met on the Appalachian Trail. He’s just started the TA hiking northbound. Hope to keep in touch as he works his way to Wellington. The craziest part though were two falcons guarding a nest near a marshy tussock field. The hut log books had warned me about them. They call loudly, then fly at you. One dives low and comes straight at your face while the other comes in high from behind. They were relentless and once I ended up on my back ducking the one heading straight at me–intimidating as hell. Was an exceedingly long day to make it to the cabin, capped with the need to ford a decent sized river almost at the hut’s doorstep. Freshly soaked shoes, great way to end a long day. Still drizzled but more sun than clouds today. Slept like a dead man last night–was really tired. Nevertheless, I got a decent early start on a beautiful, generally well-marked well-formed trail. 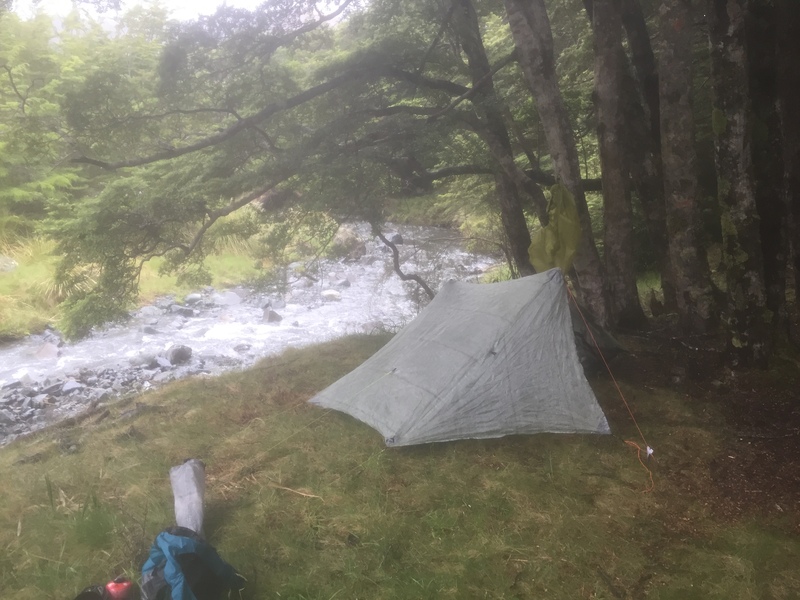 When I got to the flood bridge, I saw Jan’s tent (but let him sleep). The rest of the hike was on a gravel farm road– after a bit I snagged a ride from a woman who helps coordinate hunting trips on one of the big stations up on the lake. She said she usually did not pick up hikers, but good karma comes around. She soon had a flat which I fixed for her. Got to Te Anau to resupply for the big push to Riverton. Too bad I couldn’t stay a while, a pretty cool town on a lake that caters to people going on the great walks in Fjordland. It’s funny, now each little task that I do as I have been these past 3 1/2 months I wonder if it will be the last time. I’m sure I’ll use my tent again before the end, but there are a lot of huts on the track, and then I’m in towns for the last couple days, so who knows? I’ve also been making a lot of post-trail arrangements–flights to Christchurch and then Wellington, hostel on Stewart Island, etc. Starting to get that sense of an ending, not sure I like it (though I think my feet will). 38 km down a foggy, misty, drizzling river valley, nuff said. Got transportation to the trail head (which is across the lake from Queenstown and so is a long van ride around). I was the only passenger, so Mr. Buckley explained the transformation of Queenstown in the 50 years he has lived here. A couple of key events changed a small, generally empty lakefront town to the high adventure attraction it has become–mostly happening in the 70s. Air travel costs dropped considerably in that decade, and Queenstown, unlike some of other, similar towns has a good airport. Then they built a bridge over the Dart river at the top of the lake which opened great walks in the fjord lands to access from Queenstown. So now the place is wall-to-wall high adventure booking stations, dozens of restaurants, hotels, hostels, and bars. We stopped for coffee at the Kinloch Lodge, an old restored place on the western side of the river/lake– very pleasant sitting on the restaurant deck looking out over the lake before heading on back to the trail. I had seen Jan in town, and we both got to the trailhead at more or less the same time. There were a number of other hikers, but they were day or short loop hikers, and soon it was just me and Jan. 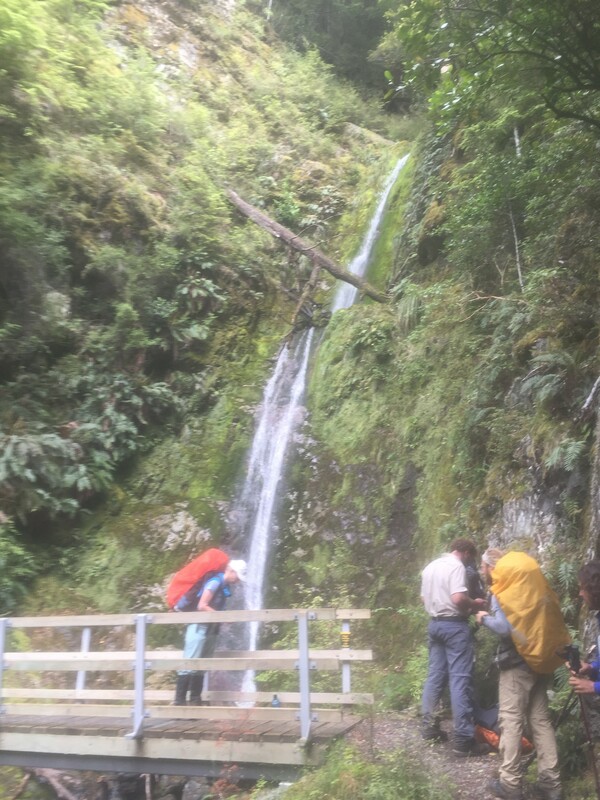 The first half (Greenstone Trail) was incredibly well made– a veritable sidewalk–and the second half, the Malvora Walkway was a poorly marked marsh hike. I kept worrying I would lose my shoes in the muck, but they held on. 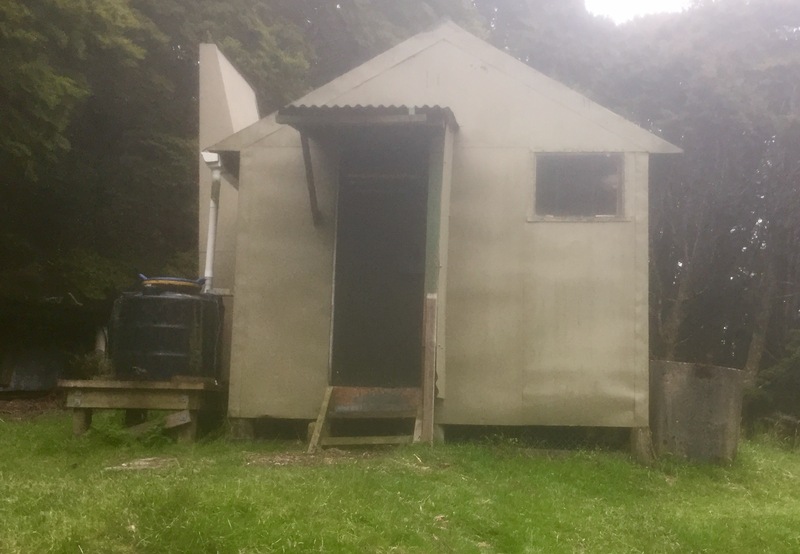 I stayed at Taipo Hut (adequate but not interesting, in the bend of a river and a cow pasture). It did have a rotating gate made from an old wooden wagon wheel that reminded me of George Sturt. Jan continued on to Boundary Hut (another 12 km). Might not see him again as he is carrying a lot of food and pushing hard to the end. I’ll need to resupply at least once before Riverton, so it looks as though in a couple of days, I’ll try to hitch to Te Anau from route 94. I want to be sure to enjoy this last part, so I don’t want to get too caught up in a race to the finish, but I am ready to get to Bluff–fewer than 300 km now.